Kavaratti Island Laccadive Islands, Arabian Sea. This is a fine 1954 U.S. Army Air Forces aeronautical chart or map of the Lakshadweep Islands of India. It covers the islands located in the Arabian Sea off the southwestern coast of India and depicts various reefs and islands including Byramgore Reef (Chereapam Reef), Bitra Reef, Peremul Reef, Suheli Par, Chetlat Island, Kiltan Island, Cardamum Island, Pitti Island, Tree Island Agatti Island, Minicoy Island and Kavaratti Island, the capital of the Union Territory of Lakshadweep. Verso of this chart features legends and a world aeronautical chart index. 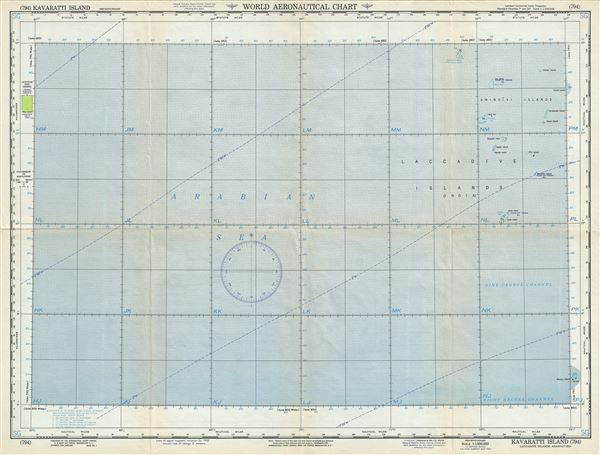 This chart was published by the USAAF Aeronautical Chart Service, Washington, D.C., and was issued as chart no. 794. First issued in 1946, this is the first revised edition issued in May 1954.